This might be the third time I've read this book. I say might be, as roughly a decade separates each reading of what is one of the best alpine adventure books ever written, and I'm not 100% sure that I have read it three times or possibly more. In some ways this is a good thing, as each time I've read Into Thin Air its like I'm reading it for the first time and after each reading I remember just how good it is. An accomplished mountaineer and climber, Krakauer joins Rob Hall's Adventure Consultants Guided Expedition to write about a guided ascent of Mount Everest for Outside magazine. Among the six people who summitted Everest on that ill-fated day, four of his teammates would never return due to a serious of events that combined resulted in a catastrophic outcome. A further five climbers from three other expeditions would also lose their lives over the same time period making this one of the most deadly periods on the mountain. In context, however, the deaths were not out of the ordinary - Everest has killed more than 130 people since 1921, representing approximately one death for every four climbers who have reached the summit. But never before and since has events like this been written about in such a tightly woven spellbinding fashion by a professional writer with sufficient knowledgeable to render the retelling so accurate and entrancing. Those already familiar with Krakauer's writing from other books such as Eiger Dreams and Into The Wild, will recognise the in-depth journalistic approach he takes to meticulously researching background information and events in relation to what occurred. What differentiates this story, is his own personal involvement and the resultant rawness that is evident due to the book being written so soon after the tragedy. Krakauer writes an honest rendition of events that occurred on the mountain in order to try and understand how things went so wrong. 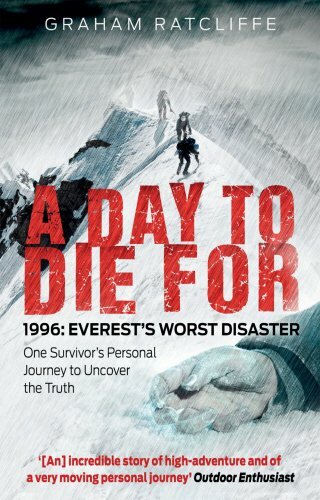 In his own words, he "wanted to provide a full report of what happened in Everest in 1996, regardless of how that report would be received". In doing so, he provides an extremely balanced account of decisions made under the most extreme of conditions and circumstances. Whilst not trying to apportion blame, he draws attention to what can only be considered mistakes made by individuals, including himself. It is this reluctance to shy away from his interpretation of the truth and what occurred up on the mountain that makes Into the Air such a compelling read. 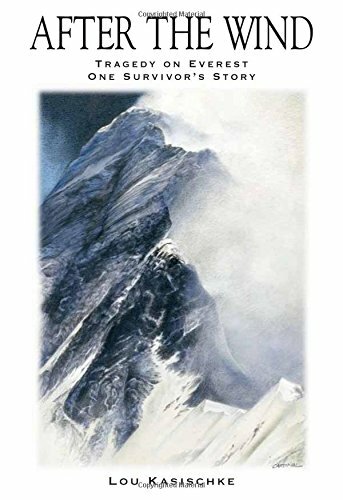 Interestingly, there have been a large number of other books written by other climbers about the events that occurred on the mountain. 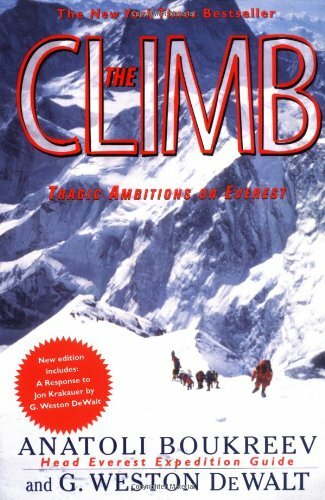 Of most interest, is Anatoli Boukreev and G. Weston DeWalt's The Climb: Tragic Ambitions of Everest. In this book they counter Krakauer's depiction of Boukreev during the tragedy, which also resulted in Krakauer adding a postscript in his own book as rebuttal. This resulted in considerable acrimony between the two, which Krakauer believed might finally have been resolved only months before Boukreev was killed in an avalanche during a winter ascent of Annapurna in Nepal. 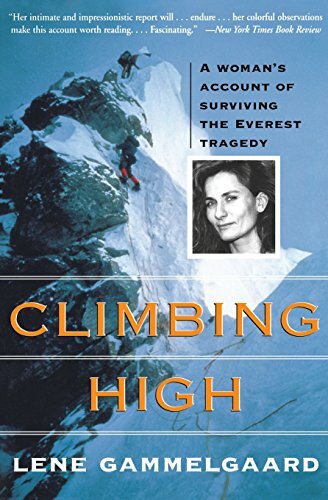 Given Krakauer's more than even handed approach to the events that occurred, I am very interested in the full story as presented in The Climb and fully intend reading this book in the near future. Other books written by climbers on the mountain that day are shown below, illustrating the wealth of material available on this single event. 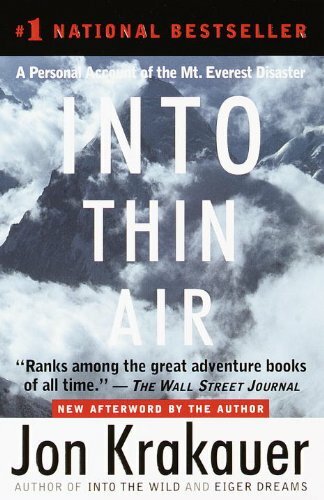 Make no mistake, the made-for-TV movie, Into Thin Air: Death on Everest is a very poor substitute for the book. 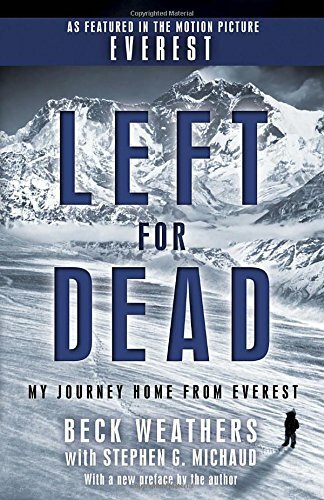 And whilst the 2015 movie Everest is better, neither comes close to providing the imagery, depth and suspense that Krakauer delivers in this thrilling read. Along with Touching the Void, this is definitely a mountaineering adventure book that you must read.